Isn't it nice to have friends around? Friends become blessings in so many different ways. A true friend is the who loves and understands us even at the most difficult time of our lives. We feel confident with our friends and never hesitate showing our cracks knowing that they will still accept us. What is more exciting is to have new more friends around. Last week, June 9, 2012, fellows from Cornerstone Fellowship Bible Church visited us - Hannah, Susan, Biblia, Jason and Joshua with Pastor Vincent Green and Pastor Mike Berry. 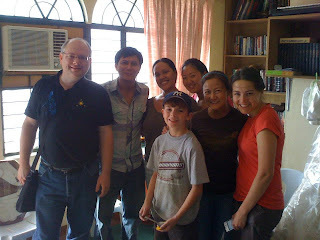 They were here in Batangas City for a week to minister. Pastor Vince and Pastor Mike taught pastors and church workers in Lipa about hermeneutics. They were able to minister to policemen, street children, women in the correctional, to our church members and most specially to our whole family. Meeting the whole team was such a blessing for me personally. It was like knowing them for a long time. They were the first people to know and see what we really do every day and how we live; being with us for the rest of week. I can really say that we - our family have completely shared our lives with them. What makes me more grateful to God for having them is that they came in perfect time that we needed someone to minster to us. They are like water that refreshed our souls. God had used them perfectly in our lives that we were encouraged to press on to continue doing the ministry for God's glory.